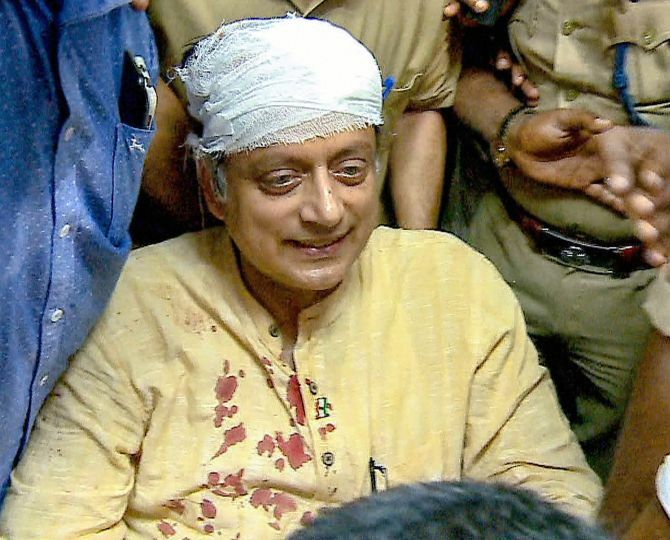 Congress leader Sashi Tharoor on Monday suffered head injuries when the hook of a weighing scale came off and its iron panel hit his head while performing 'thulabharam' ritual at a temple in Thiruvananthapuram. He was accompanied by his family members and party leaders and workers, including MLA, V S Sivakumar. While he was sitting on one of the pans of the weighing scale, the hook came off and its iron panel fell on his head, the party sources added. "Thulabharam was over by that time. The accident happened when Tharoor, sitting in the weighing scale, was waiting to see the 'deeparadhana' (aarti) being performed at the sanctum sanctorum," Sivakumar later told reporters. "The iron panel of the weighing scale came down and hit his head," Sivakumar added. Tharoor was given first aid at the government general hospital and then taken to the Trivandrum Medical College for detailed examination, party sources said. A Medical College source said that Tharoor is "keeping well" and his condition is "stable". "He is under observation.. he has no other serious health issues. But due to the flow of visitors, he has been shifted to ICU now from the observation ward," the official said adding that the MP has to undergo a repeat scan. In a press release, Congress party leader Thampanoopr Ravi said here that Tharoor's election programmes for the day has been cancelled.